The Supreme Court of Japan has upheld a law which forces transgender people to get sterilised before they can legally change their gender. The Supreme Court of Japan has upheld a law which forces transgender people to get sterilised before they can legally change their gender. The panel of four justices ruled unanimously on Thursday (January 24) to reject an appeal filed by Takakito Usui, a trans man who wants to change the gender on his official documents, Australian outlet SBS News has reported. Usui was trying to overturn Law 111, which requires any person seeking to change their legal gender to have “no reproductive glands or reproductive glands that have permanently lost function.” “The essential thing should not be whether you have had an operation or not, but how you want to live as an individual.” — Takakito Usui Trans people also have to possess “a body which appears to have parts that resemble the genital organs of those of the opposite gender,” according to the 2003 law, which was ruled constitutional by the Supreme Court judges. Usui, whose legal campaign is now over, responded to the ruling by saying: “The essential thing should not be whether you have had an operation or not, but how you want to live as an individual.” Supreme Court of Japan judges explain transgender ruling In their decision, the justices said that Law 111 prevented “problems” in relationships between parents and children which could result in “confusion” and “abrupt changes” across Japanese society. They offered a sliver of encouragement to trans activists by saying that the legislation was invasive and should be reviewed regularly as cultural attitudes shift over time. Presiding justice Mamoru Miura and one other justice also wrote an additional opinion in which they said “doubts are undeniably emerging” about Law 111. 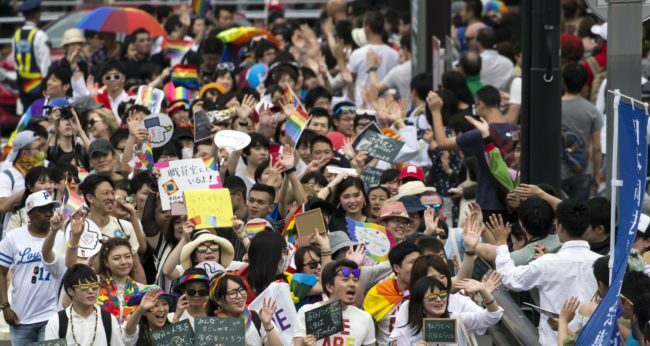 Japan has some way to go before transgender equality (Tomohiro Ohsumi/Getty) “Suffering related to gender, felt by people with gender identity disorder, is also the problem of society as a whole, which should encompass the diversity of sexual identity,” they wrote. Usui’s lawyer said that parts of the judges’ ruling could help the wider campaign to get politicians to change the law. Japan is in the process of addressing transgender rights Last year, the Japanese government announced that it would subsidise gender affirming surgery for trans people—as long as they are not receiving hormone treatment and do not have any other pre-existing conditions. Once the surgery is covered by public insurance in Japan, a patient will only need to pay up to 30 percent of the total surgery expenses, reported Japan Times. However, trans people in the country seeking gender confirmation surgeries still face numerous obstacles. Applicants are required to be sterile, single, without children under 20 and undergo a psychiatric evaluation to receive a diagnosis of “Gender Identity Disorder”—usually known as gender dysphoria in the US and UK.